The Samsung Galaxy S6 edge is a device with a slight, playful curve on both ends of the screen, but that’s enough for it to feel like a device from the future. 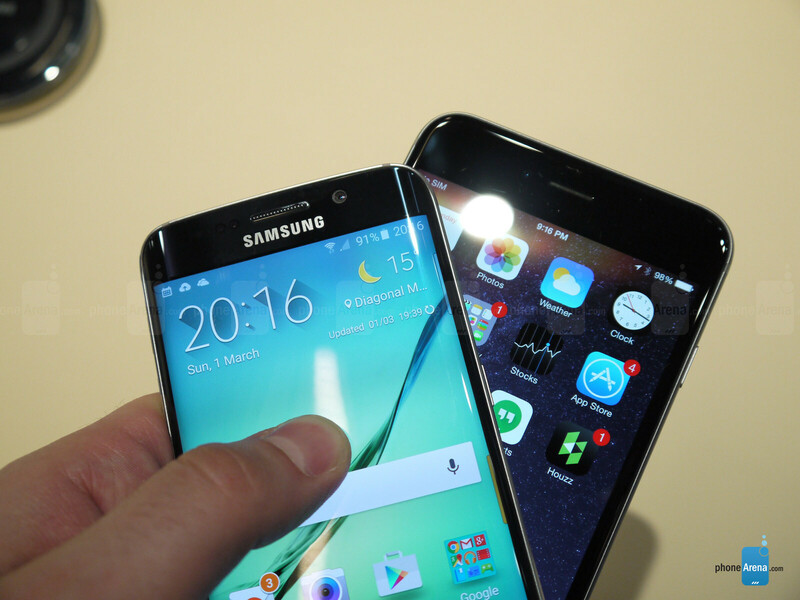 Many of you will face the choice between the S6 edge and the Apple iPhone 6 Plus, so we’ve taken on the task to give you our first look impression when comparing these two premium devices: it’s all about a sci-fi, futuristic gadget versus the more traditional one, Samsung versus Apple, Android against iOS, a true clash of the titans. The Galaxy S6 edge is a big step up from everything we’ve seen before: the typical plastic design of earlier Samsung phone is gone in favor of a combination of a sturdy, metal frame, and a glass back and front. The S6 edge can definitely stand its ground when it comes to premium looks against the stylish iPhone 6 Plus that many pundits consider a kind of a gold standard for phone design. Is Samsung’s ‘next big thing’ really better in both the inside and the outside? Let’s find out. The Galaxy S6 edge brings big improvements in design: it’s slim and lightweight, and it’s made of metal for the frame and glass on both front and back. The iPhone 6 Plus, on the other hand, features an all-aluminum design and it’s a hair thicker than the S6 edge: 7.1mm vs 7mm. Both feel premium, made with meticulous attention to detail, and picking between the two is a lot about picking your favorite. Interestingly, the Galaxy S6 edge has a protruding camera just like the iPhone 6 Plus (with an even larger hump). It’s not something that bothers us, but it does make the device shaky when you lay it flat on a table. Since we’re comparing the 5.1” Galaxy S6 edge with the larger, 5.5” iPhone 6 Plus, there’s naturally a sizable difference between the sizes of the two devices. The iPhone 6 Plus is a wide phone, measuring 3.06”, while the Galaxy S6 is narrower and more single-hand-friendly with its 2.76” of width. 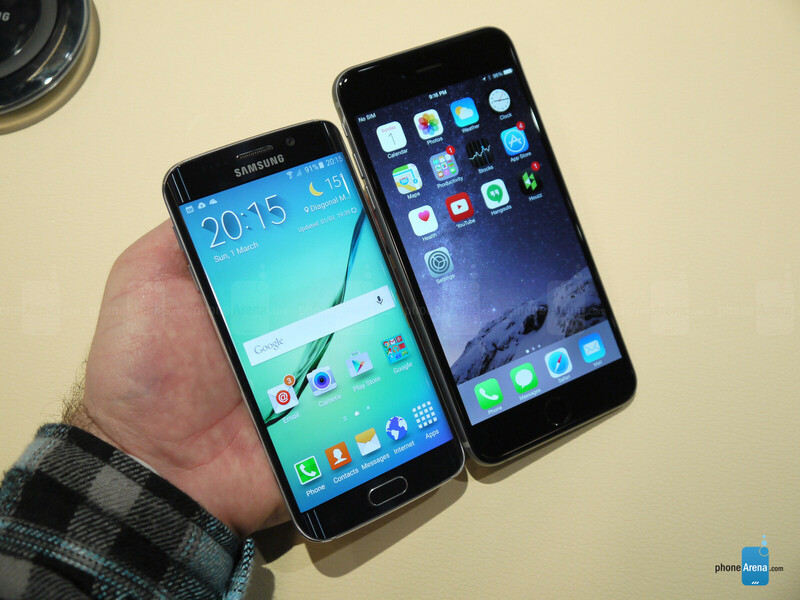 Apple’s phablet is also taller, at 6.22” vs the 5.59” of height on the S6 edge. Samsung saved no superlatives for the screen of the Galaxy S6 edge: it just plain put forth the claim that it is the best screen on a smartphone. It’s a 5.1-inch Super AMOLED screen with a 1440 x 2560-pixel (Quad HD) resolution, and Samsung has done some big improvements to the brightness of the S6, saying that it can now go to up 600 nits, and while we couldn’t verify that, we can indeed see it being much brighter than earlier Samsung displays. The edge here plays a different role than on the Note Edge - it does not interfere with the regular look of the interface (the side part is not permanently visible on top of TouchWiz), but you can bring it up with a swipe to the side to get quick access to contacts, for instance. You can also bring it up for quick info when the phone is lock, so you can save battery by checking notifications without firing the whole screen. Now, compare this with the 5.5-inch LCD display of the iPhone 6 Plus, coming with a resolution of 1080 x 1920 pixels. This works out to a pixel density of 401ppi on the iPhone versus the whopping 577ppi on the Galaxy S6 edge. Samsung has one of the sharpest screens (if not the sharpest) we’ve seen on a phone. Can you really tell the difference between the two? We do notice a slight difference in perception. What matters more is color accuracy. The Galaxy S6 edge seems to improve color accuracy, and goes on a more level playing field against the fairly good color fidelity on the iPhone 6 Plus. The added benefit of the dual edge on the S6 edge is for quicker multitasking, and for quick access to contacts (you can customize the edge to serve your own purpose, which is neat). The Galaxy S6 edge features a 14nm octa-core system chip, and it’s the first phone to come with a 14nm chip, according to the company. Samsung did not say that it is using the Exynos 7420, but all indications point in that direction. The CPU cores are four of ARM’s performance-driven Cortex A57s running at up to 2.1GHz and four battery-savvy Cortex A53s clocked at up to 1.5GHz. 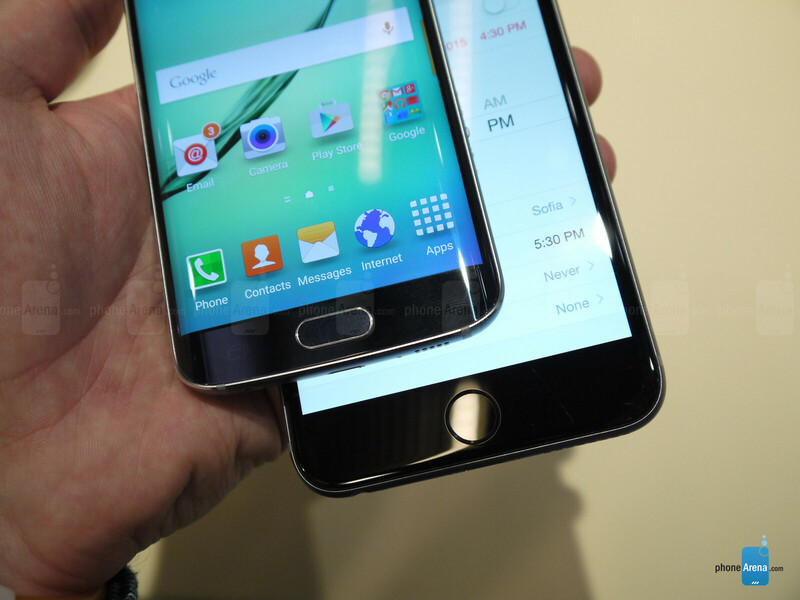 The Samsung Galaxy S6 edge features a 16-megapixel main camera, while the iPhone 6 Plus has a sensor with half the megapixel count - an 8-megapixel one. Both feature optical image stabilization (OIS). If you watched the Unpacked event, you have seen Samsung take a jab at Apple and show some very impressive samples to demonstrate how it has outgunned it in the camera department. Samsung pin-points the large, f/1.9 lens that lets much more light in as the main reason (the 6 Plus has a slower, f/2.2 lens). We’ll add camera samples soon to show you the difference between the two. 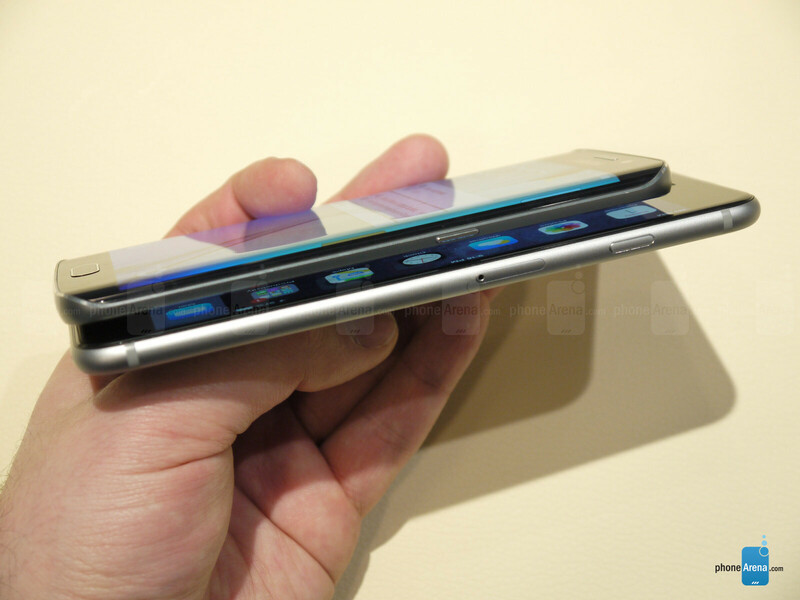 If the Galaxy S6 has what Samsung describes as ‘six appeal’, the S6 edge must have ‘edge appeal’. The dual edge is a slight but unique innovation that the Apple iPhone 6 Plus lacks, and that’s an important observation to keep in mind. Samsung is clearly comparing itself with Apple, and the edge gives it a unique feature that Cupertino does not have answer to. For all else, Samsung has taken a bold stand to come on par, or outgun Apple: color accuracy seems to be improved (we’re yet to see to what extent) with the already good one on the iPhone, and the S6 edge is sharper; the new octa-core chip is more efficient and should bring Samsung closer to the iPhone 6’s industry-leading single-core CPU performance, while topping it in multi-core; the 16-megapixel camera seems to have been tweaked to deal with its biggest weakness - night photos, and for all else is more detailed than the one on the iPhone 6, and battery life is very close between the two. The battle is officially on. I like how the flagships this year are coming out with their own theme selections for more customization. And the internet will be filled with 'You're comparing S6 to a 2 year old relic' again. Touchwiz is such an ugly POS. Eww. Gross. Don't want. Nothing about Touchwiz screams "premium." To be honest iphone 6 is stil has a upper hand in Design, gpu , overall performance . 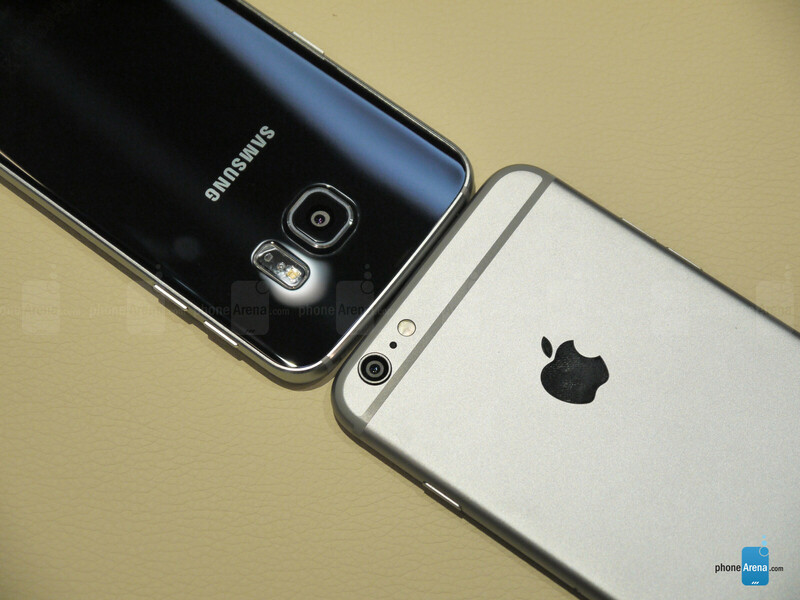 U guys were bashing apple for protuding camera No look whats samsung has done with s6 Its a mixture of iphone 4s & 6. M9 is a far far better than s6.